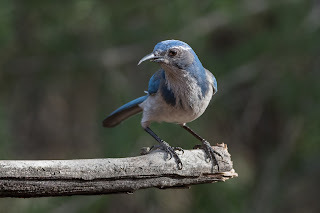 Hobbyist wild bird feeding advice from my backyard experiences in Oregon and Northern California. 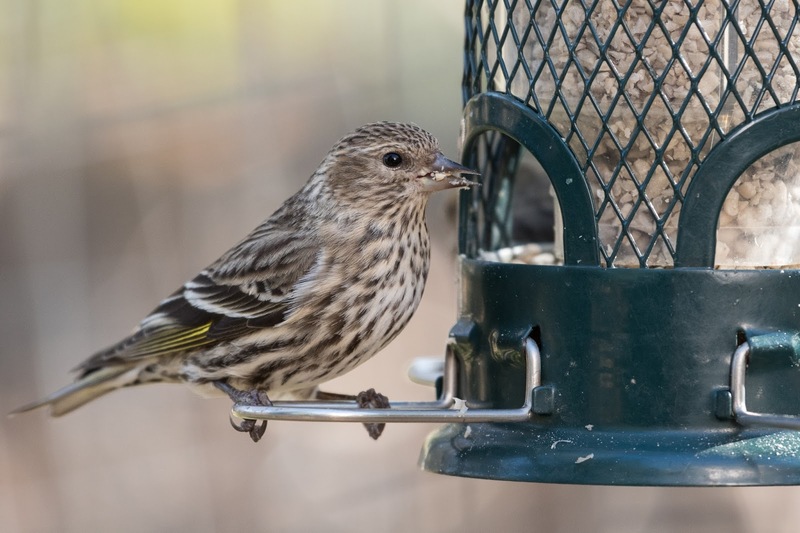 Do birds rely on bird feeders? Do birds rely on bird feeders? Is feeding birds harmful? The short answer from The National Audubon Society and The Cornell Lab of Ornithology (two reputable organizations in the U.S. birding and conservation community) is no, bird feeders are not harmful. Studies have shown that many species benefit from the extra food from bird feeders, especially during harsh winter weather. Improper care of bird feeders and surrounding areas however, can spread harmful disease due to many individuals clustering together in one location. Watch out for the most common contagious diseases: Salmonella, House Finch Eye Disease, and Avian Pox. Take proper action to clean feeders and the ground below if you notice any of these diseases among your feathered visitors. Two short articles that explain in more detail are linked below. Both have valuable information and will give a good overall understanding of this topic. 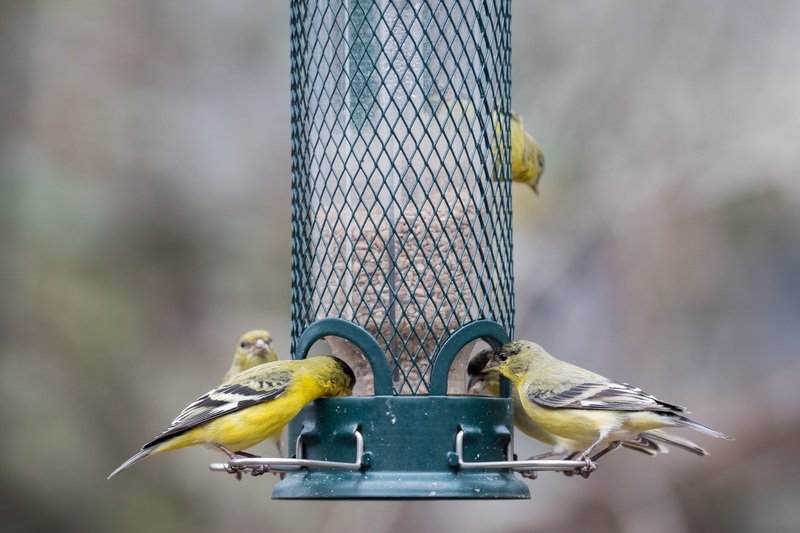 The Cornell Lab of Ornithology: Do Bird Feeders Help Or Hurt Birds? The National Audubon Society: To Feed, or not to feed. Many nocturnal wildlife species may be drawn to your yard in search of bird food remnants. If this becomes a problem, the best preventative measure is to minimize any bird food left on the ground overnight. - Use catch trays under seed feeders. 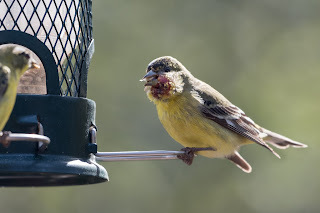 - Feed sunflower hearts/chips so that no shells are scattered under the feeder. - Switch to feeding finches nyjer seed (aka: thistle), which mammals don't like. - Only use hummingbird feeders and suet feeders (no seed feeders), so that minimal food gets on the ground. - Consider using premium seed that will all be consumed (i.e. sunflower hearts) rather than "wild bird seed" which contains cheaper ingredients like red milo and cracked corn, which only a few species (such as doves) will eat. - Fill feeders or scatter ground seed in the morning, so that birds have a chance to eat it all before nightfall. - Bring feeders inside at night. 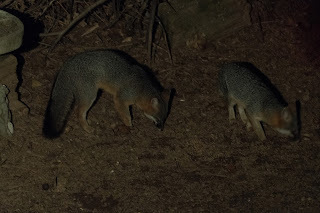 Gray Foxes scavenging for leftover "wild bird mix" seed. - try a suction-cup window feeder (my preference). The small amount of ambient heat from the window prevents nectar freezing. - Birds that let you approach very close. - Birds sleeping on the feeder. - Birds that look extra puffy or fat. - Pine Siskins are most susceptible, and it spreads quickly between flocks. - Some bird species are more susceptible than others. - Can be passed to humans, dogs, cats, and other animals. - Usually fatal. Not able to be cured by wildlife rehab centers. - Highly contagious. Spreads in bird feces. - Clean and bleach feeders & bird baths. - Rake area under feeders. - Remove feeders for 2 weeks to allow flocks to disperse. - Bacteria can remain on surfaces for up to 2 months. A healthy Pine Siskin. This species is most likely to get sick from Salmonellosis. 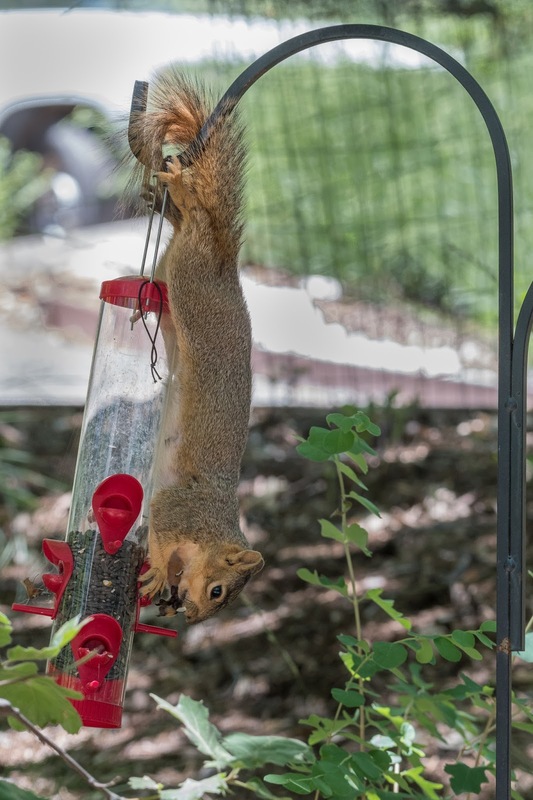 Squirrels can climb poles, chew plastic and wood, and eat all your bird seed! Eastern Fox Squirrel hanging from shepherd's pole and stuffing it's cheeks with sunflower seed. 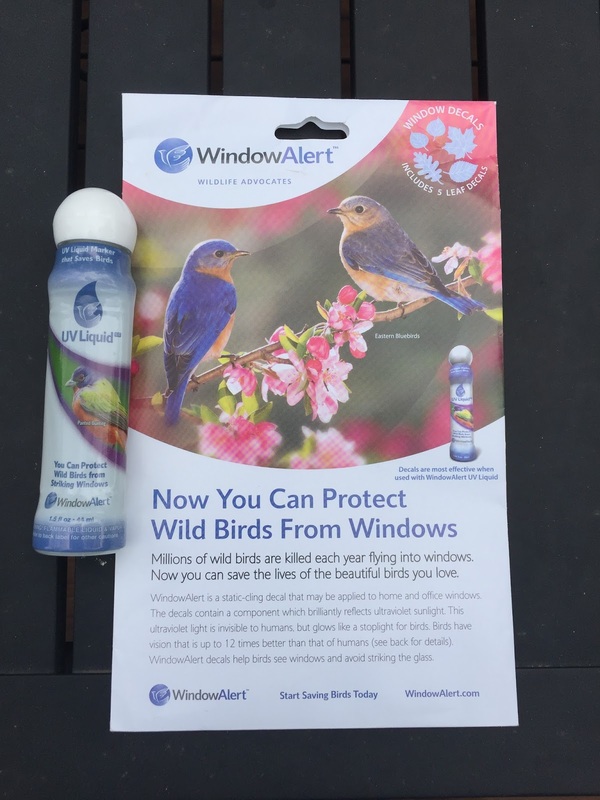 Here are a few examples of squirrel-proof products. Note that squirrel proof seed feeders are usually not compatible with rain covers, so may not work well in rainy climates. Don't be afraid of trying squirrel-proof suet feeders - woodpeckers can still reach the suet! Another option is squirrel-proofing an entire shepherd's pole system with a squirrel baffle attached to the pole, or hanging feeders over a deck railing out of reach. Squirrel-proof seed feeder "Squirrel Buster"
- Lesions/growths/warts around unfeathered areas, such as beak, legs. - Do not confuse with House Finch Eye Disease (Conjunctivitis). - Not fatal unless lesions prevent bird from feeding. - Rake area below feeders. 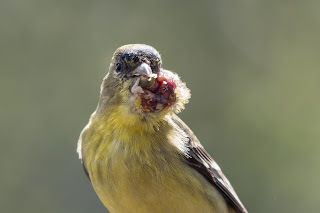 Lesser Goldfinch with avian pox lesion at base of beak/neck. Hulled sunflower for the most species and least mess! I've had the most success with species variety and least mess/wasted seed when offering hulled sunflower seed, also known as sunflower hearts or chips. Offer this seed in a tube-style seed feeder for finches, grosbeaks, woodpeckers, nuthatches, and others. 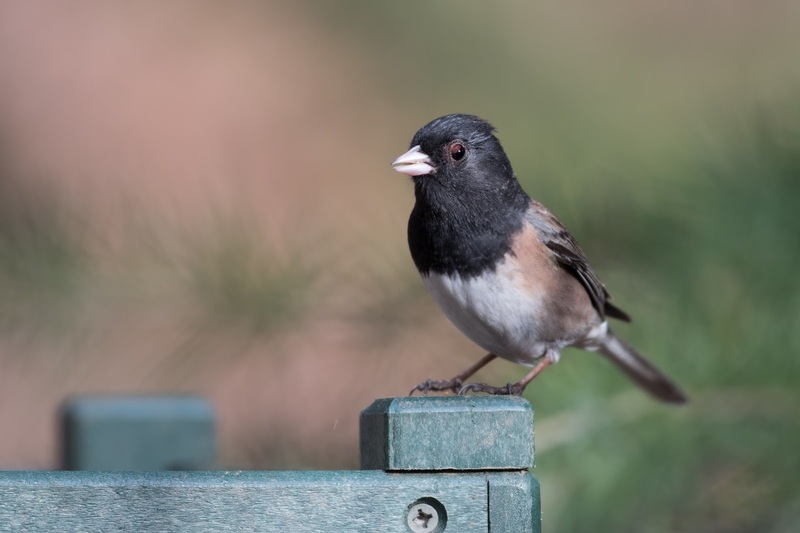 Ground-feeding birds such as sparrows, juncos, towhees, doves, quail, etc, will clean up any remaining seed that the finches drop on the ground. - Upper and/or lower beak (mandibles) that look longer than normal for that species. - Broken off parts of beak due to damage from overgrowth. California Scrub Jay with Avian Keratin Disorder indicated by overgrown upper mandible and broken lower mandible. 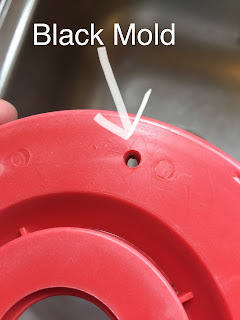 Black mold on hummingbird feeders is bad news. It can cause sickness among the feathered friends you are trying to feed. Be sure to clean hummingbirds feeders thoroughly each time you change the sugar water (at minimum, once per week, or twice per week in summer months). Use special tools or Q-tips to clean the nooks and crannies of your feeder, not forgetting the feeding ports. Use bottle brushes or special sponge brush tools to clean bottle feeders. Your local bird feeding chain store or website should have these tools. Saucer-style hummingbird feeders are easier to clean than bottle feeders, due to their less complicated design. 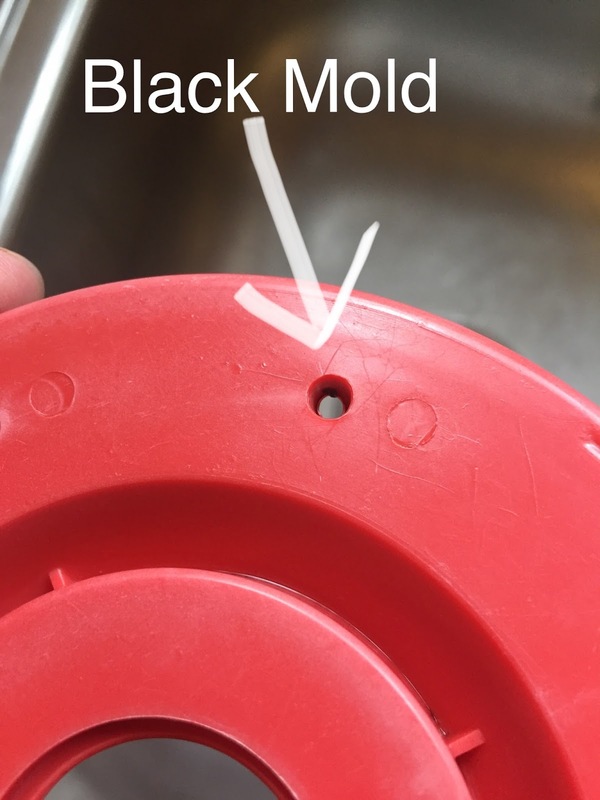 Consider switching to a saucer-style feeder if you want to simplify the cleaning process. Providing water for wildlife, especially mid-summer! Don't forget about the needs of the other wildlife that call your yard "home." Providing water, especially in the heat of summer, will be greatly appreciated by your local wildlife. Squirrels and other wildlife (such as nocturnal species you may never see), can drink easily from make-shift ground baths, such as a shallow planter drip tray filled with water. 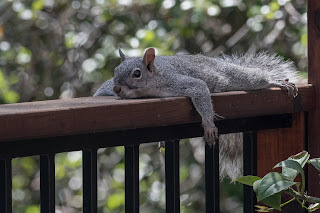 A western gray squirrel laying flat to disperse heat on a hot summer day. - Birds with crusty, red, swollen eyes. - Birds that appear blind in one or both eyes. - Affects many species, not just House Finches. I have witnessed this disease in California Towhees, Evening Grosbeak, Lesser Goldfinch, Dark-eyed Juncos. 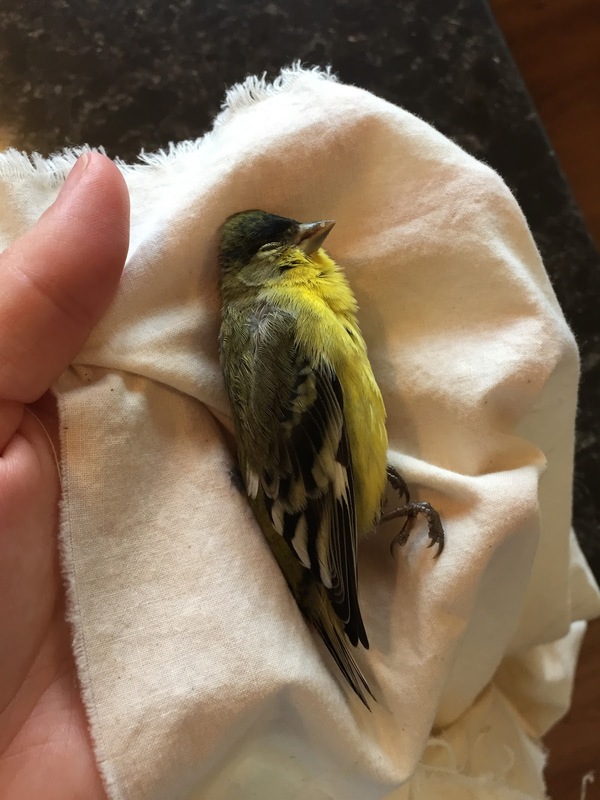 - Some birds heal on their own, but many go blind and die from depredation or starvation. - Clean and disinfect feeders. Be sure to clean feeders regularly. - Don't allow wet seed to clump and mold inside feeder. 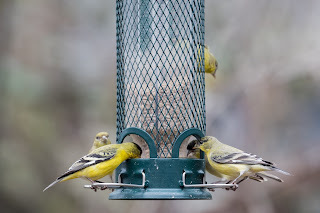 Use a rain cover or bring feeders inside during rainy weather. 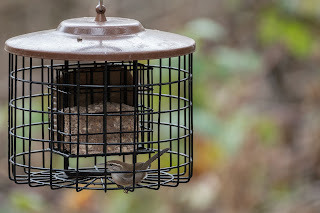 - Rake ground below feeders. - Take down feeders for awhile to let sick birds disperse. Prevents sugar water being diluted from rain/snow, and prevents bird feces collecting on feeder if birds perch above. Red colored weather shields provide shade to slow nectar spoilage in sunny weather. Top up with plain water when you refill the feeder. This style is easiest to clean and keep mold-free. Look how reflective these windows are! Both resident birds and seasonal migrants have fallen prey to these windows that appear like an extension of trees and sky. Adding UV decals that reflect purple UV light to oncoming birds should minimize any fatal head-on collisions. There are a few different products available, such as dot strips, decals, and UV liquid. The decals shown last approximately 3 months. 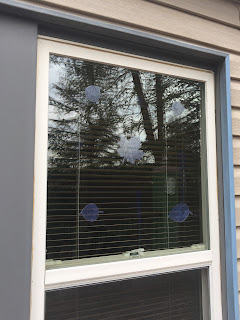 If it's inconvenient to have decals up year-round, consider using them for the prime spring migration months of April and May. 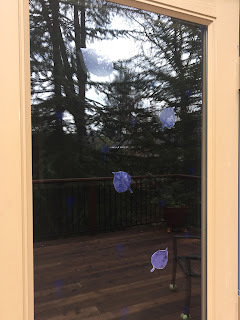 Leaf-shaped UV decals on glass door. Leaf-shaped UV decals on reflective windows. Window decals & UV liquid. Lesser Goldfinch with broken neck from window strike. All images copyright Hayley Crews. Do not use without permission. Picture Window theme. Powered by Blogger.